Although using similar methodology, think-tanks of different countries have different audiences, Germans suggest Ukrainians improve the recommendations, separate analysis form emotions, use references and set up regional think-tanks. Closer mutual monitoring will help Ukrainian analysts increase their professionalism and better understand what materials are of interest to their Western counterparts, what is the best way to present them. As to German analysts, they will get a better product and a better understanding of the processes taking place in Ukraine. 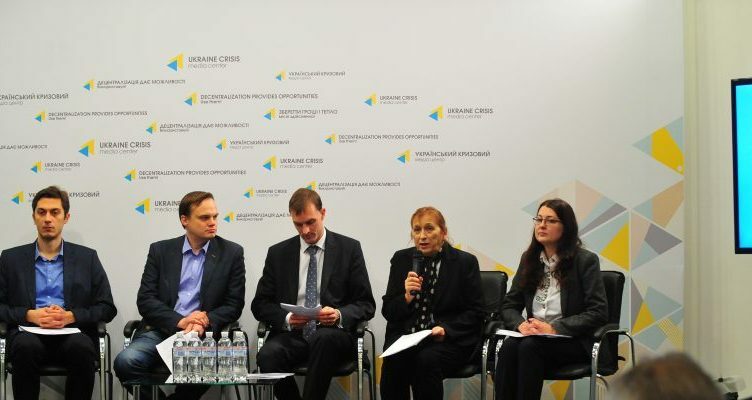 This was stated by Ukrainian and German experts who presented the results of the survey made by Ilko Kucheriv Democratic Initiatives Foundation and the German Institute of European Policy at a briefing held at Ukraine Crisis Media Center. “The work of think tanks in Ukraine is very useful for us as embassy staff, we often use their developments. This is an integral part of the analysis of Ukrainian politics,” said Michael Schmidmayr, First Secretary, Assistant on Policy Issues, German Embassy in Ukraine. The research was conducted within the framework of the project “Strengthening of Ukrainian think tanks, development of institutional capacity and improving cooperation with partners in the EU”, which is implemented by the German Institute for European Policy and Ilko Kucheriv Democratic Initiatives Foundation. The project is financed by the Ministry of Foreign Affairs of the Federal Republic of Germany. Representatives of 20 think tanks, mostly from Kyiv, were interviewed in Ukraine. In Germany, 11 leading think tanks cooperating with their Ukrainian counterparts were interviewed through semi-structured interviews. In Germany, think tanks are purely scientific centers. “Their primary activities are researching and providing political advice,” said Liudmyla Melnyk, research fellow at the Institute of European Policy (Berlin). German colleagues described Ukrainian analytical centers as a “hybrid” of classical think tanks and civil organizations – they are both analytical consultants and community leaders who promote a policy. Iryna Bekeshkina, director of Ilko Kucheriv Democratic Initiatives Foundation, noted that this is adaptation to Ukrainian realities. “In Ukraine, for a think tank to be effective, think should be like a real tank – we have to “pitch in” our analytical developments, policy achievements,” she explained. Ukrainian analysts consider the key objectives of their activity to be research, development of analytical product and influence on decision-making. 14 of 20 respondents believe that they are able to promote solutions. However, only 9 of 20 consider authorities to be consumers of analytical materials. “In fact, their materials are used mostly by the media, NGOs and international donors, who most often request for these products,” said Oleksiy Sydorchuk, political analyst, Ilko Kucheriv Democratic Initiatives Foundation. The basic tools of experts’ influence are public events, publications in mass media and social networks. Informal links between experts and authorities play an important role in promoting certain decisions. This indicates a lack of systematic and institutionalized cooperation. Cooperation with international colleagues is also irregular and project-based. For German analysts, in contrast to Ukraine, the media is a minor audience. The research also showed that Ukrainian experts underestimate German colleagues’ awareness of the situation. “Germany is one of the few countries where the expert community has formed who closely monitors the situation in Ukraine, and even speaks Ukrainian. […] Some common things such as the military aggression and that Ukraine is right in this situation should not be explained to them. They need the deeper analysis – what to do in particular,” noted Dmytro Shulga, director of the European Program Initiatives, International Renaissance Foundation. As we prepare material for our foreign colleagues we should take into account the distinct scientific character of German institutions, stressed Liudmyla Melnyk. German analysts have commented that the Ukrainian reports often lack a clear differentiation between their own position and analysis; there are too many emotions in them. Besides, the context often is not taken into account; references are missing; there is no systematic data collection. “The report should be based on the presentation of facts and analysis rather than on the messages,” she noted. This is also true of the website, design of reports and project communication; all require specifics and completeness. There should also be more rapid translation of materials into English. To enrich the experience and better understand each other it would be useful to invite experts for training and co-organize events for journalists and politicians. As to activities of think tanks directly in Ukraine, according to Dmytro Shulga, they should move from advocacy of a certain position to advocacy of a weighed compromise decision developed as a result of the analysis of the position of all stakeholders. Olga Lvova, founder and director of the initiative “Think Twice UA,” drew attention to the need of creating regional think tanks. “There are no think tanks in some regions, and it is a problem, because in the context of decentralization the efficient cooperation between think tanks and authorities is very important,” she emphasized. Deepening EU-Ukrainian Relations: What, why and how?